A jet carrying 55 passengers and seven crew members exploded into a fireball when it missed the runway and nosedived into the ground on Saturday. Although the investigation is still ongoing, Russian aviation experts expect that the Boeing 737-800, which was heading from Dubai, could have crashed due to a heavy gust of wind. Regardless of the cause, officials from the airlines have confirmed that all 62 people on board were killed in the crash, four of them children. And it seems that most of the Flydubai plane crash victims were close to home before crashing in the southern part of Russia. The Russian Emergency Situations Ministry posted a list of the passengers and crew members on board, information it confirmed with the Federal Air Transport Agency. 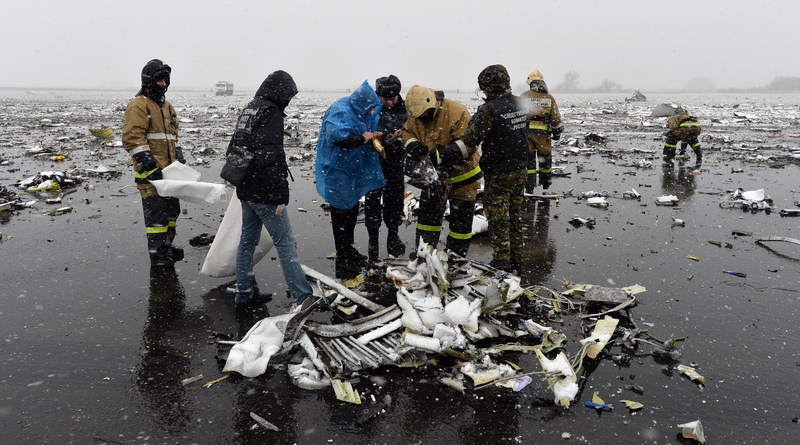 In total, 45 Russian citizens were killed in the crash, 44 of them were passengers, and one was a crew member. The bulk of the Russians were citizens of the Rostov region. The plane crashed in Rostov-on-Don, which is the administrative center of the Rostov region. The remainder of the passengers hailed from several Asian and Eastern European countries. Eight Ukrainians were on board as passengers, two passengers hailed from India, and one came from Uzbekistan. The seven crew members were extremely diverse, coming from Spain, Seychelles, Kyrgyzstan, Colombia, Russia, and, finally, the pilot was from Cyprus. Russian President Vladimir Putin, through a spokesperson, expressed his deep condolences to the families of the victims and ordered that assistance be given to the families. In a statement, Cypriot President Nicos Anastasiades expressed grief over the loss of the pilot, Aristos Sokratous, who left behind a pregnant wife. To the family of Aristos Sokratous, in particular, President Anastasiades expresses his deepest condolences and declares his support during this time of great pain they are experiencing for the untimely loss of the pilot. Our primary concern is for the families of the passengers and crew who were on board. Everyone at FlyDubai is in deep shock and our hearts go out to the families and friends of those involved. We don’t yet know all the details of the accident but we are working closely with the authorities to establish the cause. For now, other flights have been directed away from the Rostov-on-Don airport. The flight recorders from the downed Boeing 737-800 have been secured, which could help shed some light on exactly what caused the crash. That, at least partially, could bring some measure of closure to the dozens of hurting families.